Hoeffel, Other Lawmakers Seek Tighter Food-Safety Regulations. Also, a Class-Action Suit to be Filed in the Deadly Listeria Outbreak Traced to a Montco Poultry Plant. Rep. Joseph M. Hoeffel (D., Pa.) joined several congressional colleagues yesterday in calling for tighter food-safety regulations following a deadly listeria outbreak traced to a Montgomery County poultry plant. And attorneys in Chicago said they would file a class-action lawsuit next week in Philadelphia on behalf of 20 people who said they were sickened in the recent listeria outbreak. 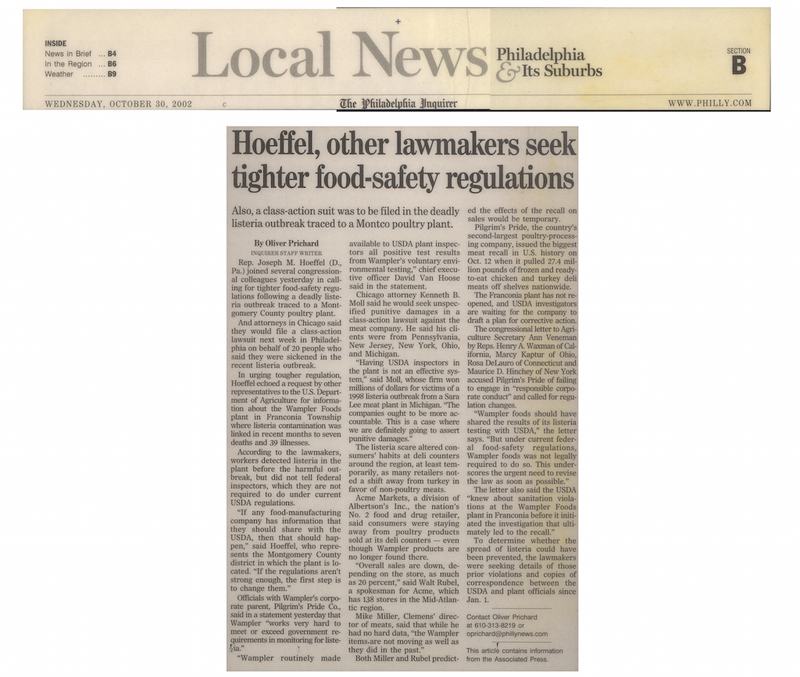 In urging tougher regulation, Hoeffel echoed a request by other representatives to the U.S. Department of Agriculture for information about the Wampler Foods plant in Franconia Township where listeria contamination was linked in recent months to seven deaths and 39 illnesses. According to the lawmakers, workers detected listeria in the plant before the harmful outbreak, but did not tell federal inspectors, which they are not required to do under current USDA regulations. "If any food-manufacturing company has information that they should share with the USDA, then that should happen," said Hoeffel, who represents the Montgomery County district in which the plant is located. "If the regulations aren't strong enough, the first step is to change them." Officials with Wampler's corporate parent, Pilgrim's Pride Co., said in a statement yesterday that Wampler "works very hard to meet or exceed government requirements in monitoring for listeria." "Wampler routinely made available to USDA plant inspectors all positive test results from Wampler's voluntary environmental testing," chief executive officer David Van Hoose said in the statement. Chicago attorney Kenneth B. Moll said he would seek unspecified punitive damages in a class-action lawsuit against the meat company. He said his clients were from Pennsylvania, New Jersey, New York, Ohio, and Michigan. "Having USDA inspectors in the plant is not an effective system," said Moll, whose firm won millions of dollars for victims of a 1998 listeria outbreak from a Sara Lee meat plant in Michigan. "The companies ought to be more accountable. This is a case where we are definitely going to assert punitive damages." The listeria scare altered consumers' habits at deli counters around the region, at least temporarily, as many retailers noted a shift away from turkey in favor of non-poultry meats. Acme Markets, a division of Albertson's Inc., the nation's No. 2 food and drug retailer, said consumers were staying away from poultry products sold at its deli counters - even though Wampler products are no longer found there. "Overall sales are down, depending on the store, as much as 20 percent," said Walt Rubel, a spokesman for Acme, which has 138 stores in the Mid-Atlantic region. Mike Miller, Clemens' director of meats, said that while he had no hard data, "the Wampler items are not moving as well as they did in the past." Both Miller and Rubel predicted the effects of the recall on sales would be temporary. Pilgrim's Pride, the country's second-largest poultry-processing company, issued the biggest meat recall in U.S. history on Oct. 12 when it pulled 27.4 million pounds of frozen and ready-to-eat chicken and turkey deli meats off shelves nationwide. The Franconia plant has not reopened, and USDA investigators are waiting for the company to draft a plan for corrective action. The congressional letter to Agriculture Secretary Ann Veneman by Reps. Henry A. Waxman of California, Marcy Kaptur of Ohio, Rosa DeLauro of Connecticut and Maurice D. Hinchey of New York accused Pilgrim's Pride of failing to engage in "responsible corporate conduct" and called for regulation changes. "Wampler foods should have shared the results of its listeria testing with USDA," the letter says. "But under current federal food-safety regulations, Wampler foods was not legally required to do so. This underscores the urgent need to revise the law as soon as possible." The letter also said the USDA "knew about sanitation violations at the Wampler Foods plant in Franconia before it initiated the investigation that ultimately led to the recall." To determine whether the spread of listeria could have been prevented, the lawmakers were seeking details of those prior violations and copies of correspondence between the USDA and plant officials since Jan. 1.